The SARAH activities are divided into 7 Work Packages (WPs) covering RTD, Management, Exploitation and Dissemination. More specifically, WP1 includes all the project management activities and is led by the coordinator (IBK). WP2, led by TUHH, is dedicated to the development of novel analysis methods and processes for improving the safety of helicopter and aircraft ditching including the detailed analysis of physical effects for academic conditions (still water and simple kinematics). WP3 completes WP2 with more realistic conditions on Waves, Ground aerodynamics, and Handling and approach conditions and is led by HO. 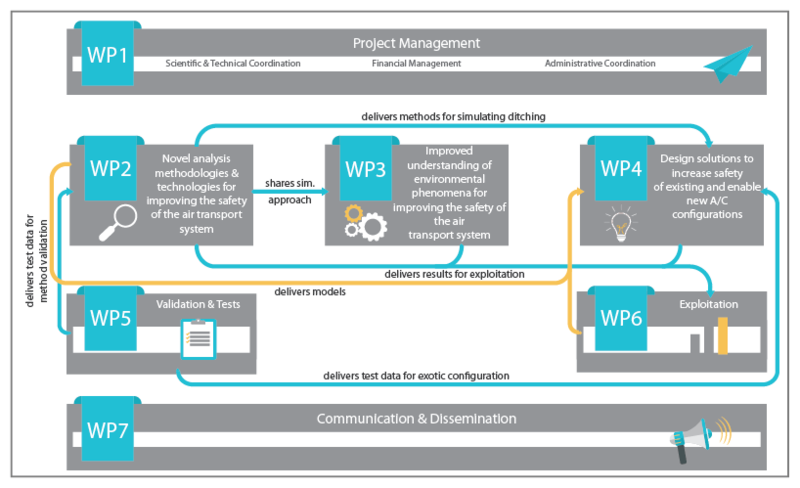 Design solutions aiming at reducing accelerations and structural damages will be investigated in WP4, led by IBK, from lessons learnt in WP3. WP5, led by CNR, is dedicated to the creation of datasets to be used for validation purposes in the other WPs where the computational tools and physical models are developed. To this purpose dedicated experimental campaigns will be performed which will be representative of the ditching phase of helicopters and aircrafts. To underline the innovation elements of the project, stress the process for promoting the project results and facilitate the application of innovative impact maximization strategies, exploitation and dissemination/diffusion activities have been split into two distinct WPs, WP6 and WP7. WP6, led by A-D, includes the industrial exploitation of results achieved in WP2-WP4 for aircrafts and helicopters and will also deliver models to WP2 and WP3 of necessary granularity. Finally, WP7, led by EASN-TIS, is associated with the communication and dissemination outreach of the project, aiming to maximize the project’s impact to the related audiences.